Ecwid and Shopify are two eCommerce web building tools that utilize diverse approaches to the process of web store creation. Whatever service you will go for, it will let you start and manage an eCommerce website. The question is: how would you like your web store to look and what features should it accomplish? Having answered this question, you will be able to decide which service exactly will work better for your eCommerce web design needs. Ecwid – is an eCommerce plugin, which is integrated into an existing website to give it eCommerce functionality. It is also possible to build a simple one-page online store with the plugin to display the show window of your best products. Ecwid is currently used by over 1.5 millions of business owners from 175 countries of the world. Shopify is the world-known eCommerce software, which comes with rich feature set, extensive selection of eCommerce options, abundance of niche tools, website templates and other features that contribute to the efficacy of the web development process. The company has over 600,000 merchants in 175 countries across the globe. To help you with the choice, it makes sense to explore and analyze both tools in details to find out their major characteristics, pros and cons as well as distinctions. The following Shopify vs Ecwid review should give you a hint on what platform to go for in the long run. Ecwid. The system features exceptional ease of use, which matters a lot for inexperienced users, who already run their own websites and wish to add small web stores to them to offer something for sale. There is no need to create a separate account here or build an eCommerce website from scratch. Just reach the dashboard of the system, specify the domain and special parameters of your website and start customizing your online store. Plugin integration implies the insertion of several code lines into the required web page body. This doesn’t take much effort, time and programming knowledge. You’ll be offered a set of tips provided by the system’s wizard to help you complete the task in the best way possible and with no hassle at all. The interface of the system is logical and visually appealing. Offering multiple settings, it ensures easy navigation and comparatively simple process of web store creation. The progress bar available in the dashboard will be a helpful tool that will make you aware of the current stage of your web store readiness. When your web store is ready, you will be able to manage it by filling out the fields available in the menu (My Sales, Catalog, Marketing, Reports). Completing these steps won’t be a problem as well due to the intuitive nature of the platform. Shopify. The eCommerce software will impress everyone by its simplicity and logical structure. Whether you are a newbie exploring the nuances of the system for the first time or a web design expert willing to create a large online store, doing this with Shopify won’t be a challenge at all. The dashboard interface is thoroughly thought-over. It is not only visually appealing and intuitive, but it triggers the desire to keep working with it. The dashboard is so user-friendly that it’s impossible to overlook something here – just follow the steps listed in the wizard to create and customize a web store. 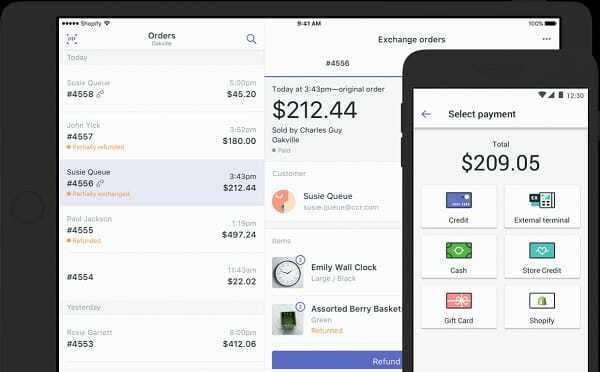 Shopify also has much to offer to those business owners, who are frequently too busy to remain in the office and, thus, have the need to manage their web stores on the go. It makes it possible to download free Shopify apps for Android and iOS to let you update your eCommerce website from any place you are in. All in all, the system creates an impression of a powerful website builder, which is still quite easy to master. It works similarly for newbies and more proficient web builders. Rich functionality combined with stunning ergonomics of the dashboard and neat interface design won’t leave anyone indifferent. Ecwid vs Shopify. Whatever system you will go for to build a website, you won’t have any serious problems with it. 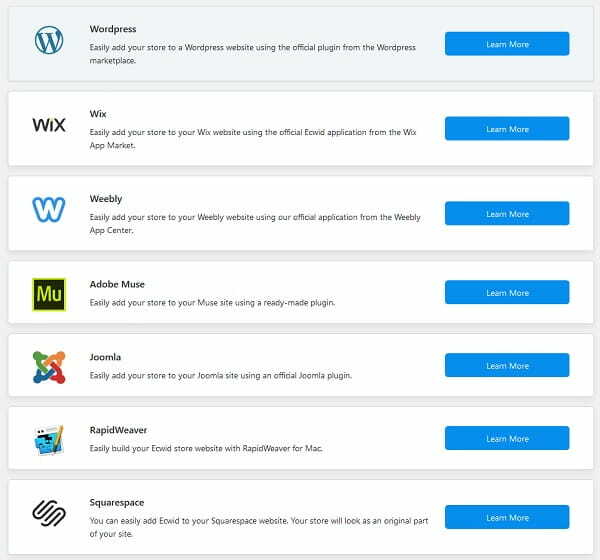 Being a plugin, however, Ecwid is less understandable, not to mention the fact that you should know how to connect it to your ready made website. Shopify, in its turn, is a sustainable system, in which all the events happen in a single ecosystem. The system provides deep flexibility and offers a logical control panel, which abounds in settings that are not difficult to explore as well. Ecwid. The use of the plugin doesn’t differ a lot from working with a niche website builder or CMS. It comes with nearly the same set of eCommerce options provided out-of-the-box, including a product catalogue, client base, reports, shopping cart, delivery, taxes, payments, notification settings, social network integration, eBay and an opportunity to install extra paid app packages to expand the basic website functionality and iOS/Android mobile apps. The plugin also comes with POS (Point of Sale) feature, which lets you sell the products not only in the web store, but also in the local retail storefront. If you have built an eCommerce website on the other platform and then decided to switch to the Ecwid-powered web store, transferring your product list won’t be difficult at all. The system makes it possible to export/import items offered for sale in the CSV format applicable in the majority of contemporary website builders. Due to the multilanguage support, users have an opportunity to choose among 50 languages to translate their storefronts. This allows attracting more traffic from abroad. Along with plugin integration, Ecwid makes it possible to launch a standalone website. Mind, however, that the functionality of the system will not be enough to create a large online store. What you can create here is a small one-page web store to showcase your products. With Ecwid, business owners will be able to use several sales channels to sell your products across different platforms, managing them from a single control panel. This is also quite convenient. If you wish to sell something in the social networks, the plugin allows choosing between several social media platforms and marketplaces. Ecwid is also known for its extensive online store management options. Users cannot only sell digital and physical products, specifying their characteristics, but also create product lists and discounts, utilize different inventory management tools and abandoned checkout recovery features, set up SEO parameters etc. To attract user attention, entrepreneurs can use automatic tax calculators, checkout options, enable language selection, offer real-time shipping rates and detailed product reviews etc. Mind that not all features are provided within a free plan. Many of them are available on paid plans only. You should also know that online stores created with Ecwid are seen by the search engines not as content, but as JS script without any content at all. That is, due to the use of the AJAX, the interface of show windows looks quite decent and works fast, but such platforms are almost not applicable for standard SEO promotion. The system has a “Promotion” section, but it includes allied options only, such as discount coupons, Facebook apps, external trading platforms, mobile apps etc. That is, Ecwid doesn’t have standard and normal SEO settings as they just won’t work at this platform because of the technical properties. Shopify. What Shopify actually excels at is functionality. Being the leader of the eCommerce niche, the software offers an impressive feature set, which provides an opportunity to launch and effectively manage a full-fledged online store, be it a small project or a hypermarket featuring thousands of products. Shopify is known for its extensive integration and synchronization options, which make it possible to give your online store extensive performance. If you have the Amazon account already, you can integrate it with that on Shopify to grow customer base and sales volume. Synchronization of your account with accounting apps like Quickbooks or Xero, for example, will also contribute to your web store performance. The software developers have recently introduced the advanced Augmented Reality tool. It helps customers explore the products they are interested in from different sides to get the idea of their special parameters that are not visible at first sight. What’s more, the platform comes with multilanguage and multichannel support by default. The system has long-lasting partnership relations with eBay, Instagram, Facebook and other platforms. Shopify developers pay special attention to the safety of their users’ information and payment transactions. To safeguard your web store from all kids of frauds, you can connect the SSL Certificate or use the Fraud Protect feature the system has introduced not long ago. Apart from web design and customization, Shopify offers extensive marketing features. Among the most popular, meaningful and useful features, it initially makes sense to mention the POS (Point-of-Sale) software. The system makes it possible to start and manage small, medium and large online stores as well as local retails storefronts. This can notably boost the sales volume and maximize the revenue. With Shopify, you can find out detailed web store statistics, apply email marketing options, adjust and modify SEO parameters, cooperate with multiple distribution channels (Amazon, BuzzFeed, eBay, Houzz etc. ), install various apps (the system currently has over 1000 free applications), use mobile app for effective web store management and complete other steps. Ecwid vs Shopify. When it comes to flexibility and feature set, Shopify is out of the question. As an eCommerce plugin, Ecwid cannot even be compared to this advanced eCommerce software. Shopify comes with powerful out-of-the-box functionality, design customization tools, marketing and custom engagement options, SEO promotion features etc. Having built a web store with the system, you’ll get full control over it. Ecwid. As an eCommerce plugin, Ecwid does not offer any template choice opportunity. You just integrate it into your pre-designed website and customize the available parameters. The number of characteristics you can change here is not large as well, but they still allow creating an appealing show window to present your products in the most favorable light. With this purpose, you can choose between three color schemes of a single design here, namely standard, beige and white as well as modify the major design customization settings. There are also applications, which make it possible to create individual designs for Ecwid show windows. They can be purchased in a brand store (thus, “Custom Themes” are available for $435). Generally, the design of a web store will be initially affected by the design of a website it will be connected to. The settings of the show window interface are minimal, although, this may be a nice solution for someone. Shopify. The eCommerce software currently has a pretty nice collection of niche templates. You can choose between free and paid designs. The number of free themes constitutes 10 items, while that of paid templates is 51. The final cost depends upon the major template parameters and depth of customization implied. Whatever template you will eventually go for, you can be 100% sure in its quality and customizability. Mind that paid themes are more feature-rich and versatile. They also have more exquisite look and customization options. You can choose a template to meet any taste, including those with diverse menu positions, quantity and type, full-screen headers, with/without sliders, with/without a show window at the home page etc. All the possible web store design components are available here as well. The website builder offers an exclusive opportunity to fully customize the selected template by means of using Shopify Liquid tool. It will be of great help to newbies and proficient web developers, who intend to support their eCommerce partners, offering a brand new and unique design customization experience. The tool has everything you need to launch a one-of-a-kind template. It includes technical tips, how-to guides, Liquid language resources and other features that might be in handy to users, who wish to create immersive and appealing eCommerce themes. 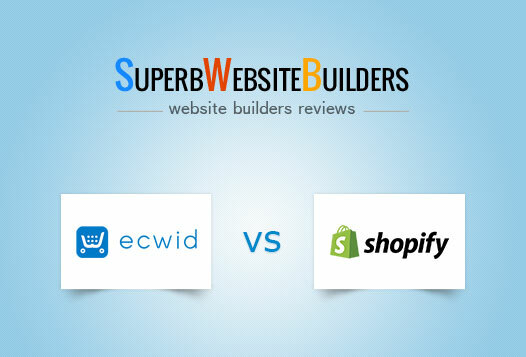 Ecwid vs Shopify. It goes without saying that Ecwid comes with a minimum set of show window design settings. It’s problematic to give individuality to it or adjust to the available website design. This is either expensive or inconvenient. Shopify, in its turn, offers almost the unlimited freedom of convenient template design and structure editing. The eCommerce software is the undeniable leader in the design aspect comparison. Ecwid. Differing with regard to the plan users go for, Ecwid customer support options are still quite limited. Free plan subscribers can only get access to email communication with the system’s support team. They can also visit a free blog that provides helpful service-related articles, recommendations, guides and eCommerce tips. Ecwid grants access to the community forum and informative knowledge base, where each user can find answers to the available questions. The platform also has a free YouTube channel with video tutorials available any time of the day. Paid system subscribers have access to the individual tech support via the email or live chat. Priority phone support is provided here as well. To use this option, you can leave the call-back request so that the team members could contact you whenever you wish. Annual plan subscribers are offered 12 hours of custom web store development. The service is viable for all paid plan users and its cost starts with $100. Shopify. The customer support service is on the top notch level, which definitely comes up to its cost. There is a powerful forum with lots of topics and branches to match user inquiries. Shopify clients can also get access to multiple articles, how-to guides, tips, FAQs and recommendations the system offers to everyone, who needs this support. What’s more, the software stands out from the crowd due to its advanced live chat with Shopify Guru and email communication option. The quality of customer support assistance is nice, the managers respond to the queries fast and, what really matters, professionally. The system has its own YouTube channel with a rich choice of educative videos. Shopify vs Ecwid. When it comes to the quality of customer support, Shopify holds the leading position. However, it should be mentioned that the quality of tech support is decent in both services. Shopify offers a better selection of text and video educative materials, powerful community forum, live chat with a personal assistant and YouTube channel to cover the needs of all users. Ecwid. The system offers a free plan you can use for the unlimited period of time. The plan makes it possible to sell up to 10 products and use a set of useful features, including unlimited bandwidth, mobile shopping cart, free start site creation, zero transaction fees, opportunity to add a web store to any website and sell simultaneously on multiple websites. However, if you intend to start a full-fledged web store with Ecwid, free plan won’t come up to your needs. As to the paid options, there are three of them here, namely Venture, Business and Unlimited plans. The cost of paid subscriptions starts with $15/mo (or $12.50/mo with the annual subscription) and reaches $99/mo ($82.50/mo with the annual payment). The difference between the plans is about the number of products they let you sell and the features included (automated tax calculation, CSV product export/import, creation of discount coupons, custom invoices, marketplace and POS integration, custom mobile store app, priority tech support and more). Shopify. The software has a 14-day trial provided at no cost at all. The trial allows testing the major features of the system to define whether you are ready to pay for one of its higher plans. Speaking about paid subscriptions, there are 4 of them here. These include Light, Basic Shopify, Shopify and Advanced Shopify. The cost of the plans ranges between $9/mo for the cheapest option and $299/mo for the most expensive solution. The plans differ from each other in terms of features and tools they come with. This especially concerns marketing options, transaction fees, sales reports creation etc. There is a 14-day money back guarantee. Additionally, the platform charges commission fees for the transactions made within the system. The fees range between 0.5% and %2 based on the plan you are subscribed to. Mind that the higher plan you use, the lower the commission fees will be (in some cases, no transaction fees are charged at all). Ecwid vs Shopify. When reviewing the price aspect, we have concluded that Shopify is a more beneficial solution. The system has a Lite Plan that provides almost the same functionality as Ecwid. There is no sense to pay more for a similar feature set. If you need a functional website, you’ll have to invest more into it. However, you will avail extra benefits in the long run, so, the plan will be certainly worth the investment. Whatever web design objectives and plans you have, Shopify will still be a more beneficial and cost-effective solution. Ecwid and Shopify are decent eCommerce building tools, which utilize different approaches to the web store creation process and offer versatile features to successfully complete the task. The choice of the service should be based upon the audience you plan to target, your web design skills, expectations and budget you are ready to invest into the project. 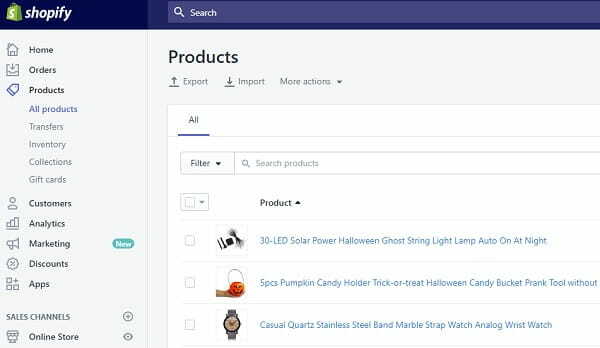 While Ecwid allows creating a web store by means of plugin integration, Shopify unveils more extensive and powerful options. Having reviewed and compared both platforms, we are ready to recommend Shopify as the best eCommerce software available in the contemporary niche. Ecwid is a full-featured eCommerce plugin, integration of which allows launching an online store on the basis on the ready made website. The plugin comes with limited functionality, which makes it a good choice for newbies and small businesses only. If you need a decent mid-to-large web store, Shopify will definitely be a smarter solution. Shopify is a sustainable eCommerce software, which allows completing a broad range of web store development tasks. The platform grants access to the advanced feature set, abundance of design customization options and affordable pricing policy. If you have serious web design aspirations and long-term goals, then you should certainly create a web store on a separate domain. Shopify is exactly the type of the platform to do that. The system will work best for users, who intend to establish credible web presence for their businesses, aiming at sales growth, traffic attraction and profit generation.